What’s a good alternative for investors who want to log out of Facebook permanently? Is anyone else checking their Facebook feed less and less? I’m not quite ready to #deletefacebook, but I have lots of clients who already have. They hate Facebook with a passion, citing multiple lawsuits and egregious ethical behaviour. The social media giant isn’t actually so bad on environmental measures. In fact, it hit its target of getting 50% of its energy from renewable sources by 2018 and plans to be 100% renewable by 2020. Facebook’s real sustainability risks lie on the governance side of things. For starters, Mark Zuckerberg is both CEO and chair of the board, two roles normally separated so that the board could fire the CEO if things go awry. That can’t happen at Facebook since Zuckerberg can simply fire any board members who mobilize against him. Like other big tech companies, Facebook has used the sneaky trick of issuing non-voting shares on the market, depriving investors of any say. If Zuckerberg wants to ‘Move Fast and Break Things’, there’s no way for anyone to stop him. Besides the fresh US government lawsuit that charges FB with enabling housing discrimination, Facebook is facing dozens of class action lawsuits for the Cambridge Analytica scandal that saw user data get illegally scrapped and sold for political gain. This massive breach of trust accounts for the red flag around digital privacy rights (see Scorecard below). Moreover, long-term investors are concerned that Elizabeth Warren has vowed to break up tech giants like Facebook. Her odds of becoming president are slim, but she’s sparked a much larger debate that could have huge negative impacts on Facebook’s share price if politicians start going after tech companies with more gusto. So what’s a good alternative for investors who want to log out of Facebook permanently? I’d much prefer to own shares of California-based Autodesk. This software maker has enabled everything from the 3D animation in The Lord of the Rings films to the modelling of the Shanghai Tower, one of the largest and most sustainable buildings on the planet. It’s also beat Facebook to the punch on the renewables front: all of Autodesk’s data centres and cloud services run on 100% renewable energy. Ditto for its real estate portfolio. 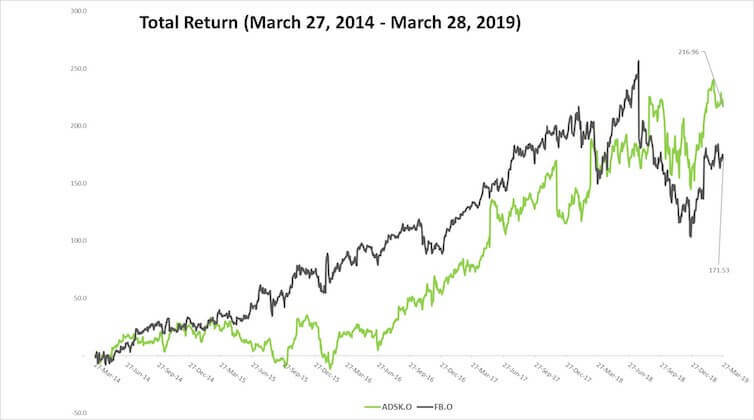 Autodesk’s stock has performed a little better than Facebook’s over the last five years, with both seeing tremendous growth without paying a dividend. Autodesk does have a higher beta suggesting it is more volatile, but you have to be ok with volatility if you’re investing in tech stocks. 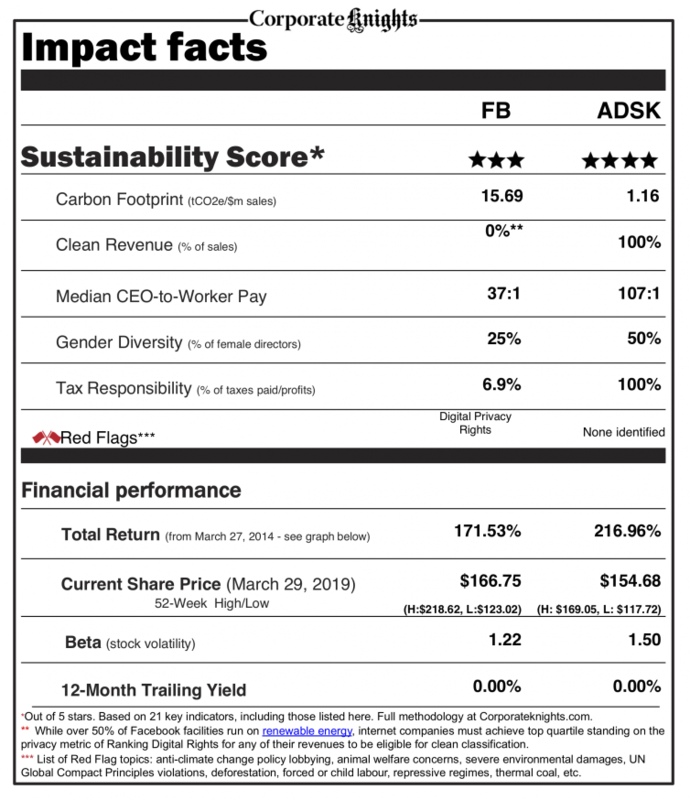 With a similar financial profile and a much better overall score, there’s no doubt that Autodesk wins this week’s Sustainability Stock Showdown. 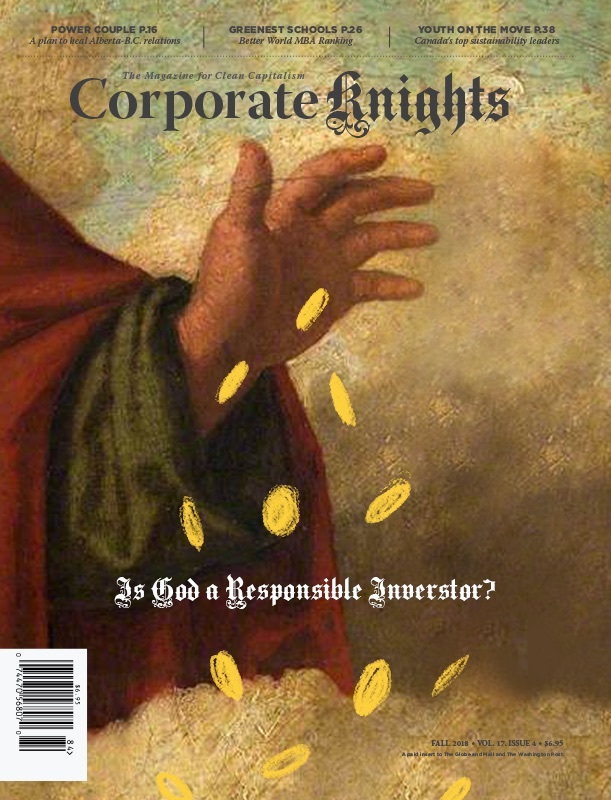 Have a company in your portfolio that you want to replace with a more sustainable option? Write us an email or send us a tweet! Tim Nash blogs as The Sustainable Economist and is the founder of Good Investing. He teaches people how to invest online and make intentional decisions with their investments. Tweet him at @timenash.